Police forces accompanied by Beit Shemesh municipal inspectors removed public signs calling for segregation between men and women in the city on Sunday. This prompted dozens of haredim to crowd around the officers. They hurled stones and cursed the officers. Some haredim called police "Nazis." There were no reports of injury. Earlier on Sunday, Beit Shemesh Mayor Moshe Abutbul held a meeting on the matter in his chambers. His order to remove the signs was carried out at 5 pm when the streets were meant to be empty of people due to the lighting of Hanukkah candles. Nevertheless, several haredim rioted and hurled stones in protest. Some of the signs were put up again later in the day by local haredim. Abutbul strongly condemned "the radical fringes of the haredi sector who tarnish the reputation of all Beit Shemesh residents. " However, he claimed that every city has radical groups who break the law, "but no one thinks to blame the rest of the population for this, just as no one blames Jerusalem Mayor Nir Barkat for violence in Mea Shearim." On Friday Channel 2 reported that a haredi resident of Beit Shemesh spat on eight-year-old Naama Margolis because she was not dressed "modestly" enough in his eyes. "I am no longer afraid. My mother is more afraid than I am. I just want the fanatics to leave Beit Shemesh," the girl said Sunday. Her mother added: "The exclusion of women from the public sphere makes my blood boil. They (haredim) are trying to take us back to dark eras; this is a grave injustice." President Shimon Peres also addressed the issue. Speaking at an IDF candle-lighting ceremony in Latrun, the president said "the people's army is an army which calls on all girls and boys to serve. All male and female soldiers share equal rights and duties, with no preferences or discrimination." The Beit Shemesh Municipality has decided to install between 300 and 400 security cameras throughout the city as part of the efforts curb ultra-Orthodox rioting. "The mayor has declared a strict policy against extremist haredim. After so much effort has been invested in trying to negotiate with them, it is time to use the other end of the whip," a city councilman said. The security cameras were meant to be installed in any case as part of the "City without violence" project initiated by the municipality. 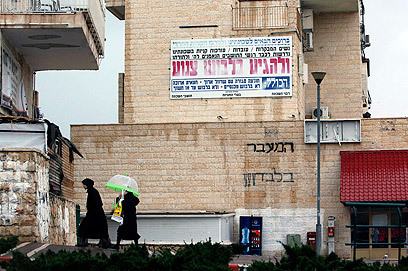 See all talkbacks "Haredim riot in Beit Shemesh after segregation signs removed"